Atom Processor (minimum 1.6) or P IV 2.8, 1Gb of RAM (minimum) - 2 GB of RAM (recommended). Sync.System Ultra Sync: DJ ProMixer incorporates the most advanced system of synchronization tracks, which can synchronize to one thousandth of a Beat, so we can mix even the loops with high accuracy which enables us to do live remixes. Wheel Multifunction: The Wheel of DJ ProMixer NB V1 Netbook Edition is a multifunction wheel that control the bend, scratch, quick search and effects. Advanced List: Big List with 11 / 14 lines in uppercase size for a real use with Netbooks screens. Depending on the size of the screen can be made up to three levels with Explorer, Playlist and Groups / Subgroups. *Complete Mixer with Crossfade between two tracks. 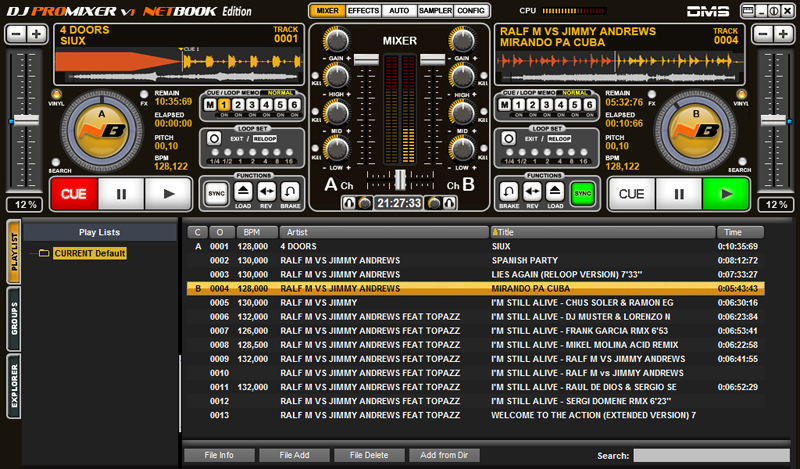 Qweas is providing links to DJ ProMixer NB Netbook Edition 1.0 as a courtesy, and makes no representations regarding DJ ProMixer NB Netbook Edition or any other applications or any information related thereto. Any questions, complaints or claims regarding this application DJ ProMixer NB Netbook Edition 1.0 must be directed to the appropriate software vendor. You may click the publisher link of DJ ProMixer NB Netbook Edition on the top of this page to get more details about the vendor.